Union Station is a huge, historic building that has been used for over 100 years. This transportation hub is one of the major ways to get in and out of this busy city, as it’s a fast and easy way to travel. Unlike some train stations, it also looks amazing – with high ceilings and white marble facades. Prior to the construction of this station, each of the major railroad operators owned their own station. Pennsylvania Railroad and the Baltimore and Ohio Railroad were the stations in question, and in 1901 they agreed to come together. It wasn’t until 1903 that President Roosevelt passed a motion to create a new station, as the location and size had been debated for nearly two years. The eventual cost of the station was $6 million, though it was initially forecasted to cost only $4 million. This was purely for the station building, as the outlying infrastructure cost $16 million, which was funded by the train operators and the government. The very first train came into Union Station in 1907, though the station building was not completed until 1908. The station is also equipped with a presidential suite, which was first used by President Taft. In 1941, this was later converted into a canteen for U.S.O soldiers during the Second World War, as the station was a major hub for soldiers who had been deployed abroad. The station has been damaged through its time, though in the largest damage there was no injuries or loss of life. In 1953 the brakes on one of the incoming trains failed and this led to the train crashing into the station. Fortunately, the fault was discovered while the train was two miles outside of the station, so it was evacuated in time. After the Second World War, Union Station declined in popularity and it wasn’t maintained by the government. Finally, in 1988, the station was awarded with $70 million in funds to restore it to its former glory. The station as we know it today was reopened in late 1988 and there were numerous additions to the amenities. Now, travellers can dine, drink and even stay in the hotels of the station – which is a far cry from the purely functional design that first existed. Trains from this station go all over America, with long and short trips catered to by operators. 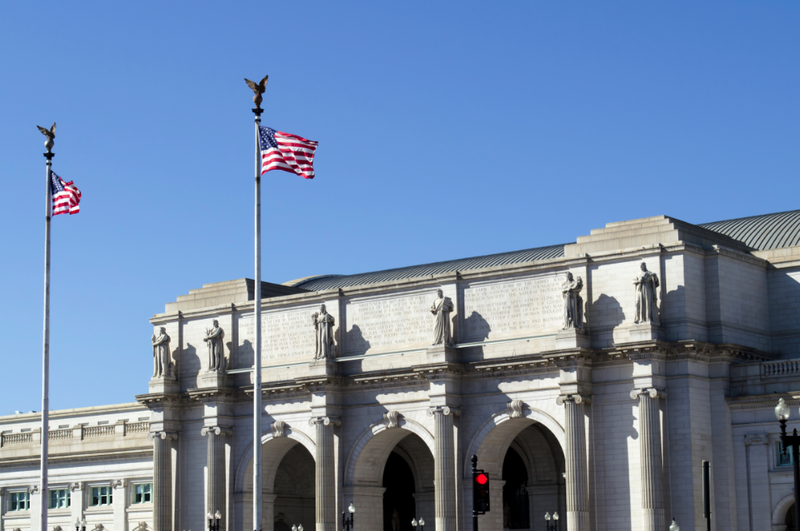 There are Union Stations all over the world, as the name means a station that is used by two or more service operators. In America alone there are Union Stations in Utah, Denver, Los Angeles and other major cities. Over 5 million people use this station each year and the rail operator Amtrak have their headquarters here for that reason. Although the station experienced a slump in popularity during its life, it has since come back to be one of the most used stations in the country. If you’re coming into DC with this service, then why not meet us there for one of our tours and learn about the city.